lt;stronggt;CWNWSCT35TClt;/stronggt;lt;BR/gt;Crown WSCT35 TCO Safewalk-Light Anti-Fatigue Drainage Mat, 3' x 5'lt;BR/gt;Help increase both the comfort and safety standards at the office. 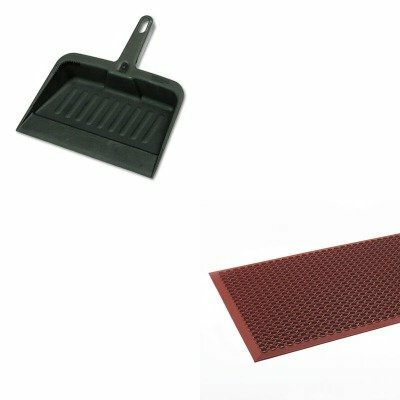 The heavy-duty antifatigue mat features excellent drainage, aeration and tractiongreat for fast-pace work environments. Molded edges reduce the risk of tripping. Easy to clean design saves you time and energy. Rubber/nitrile blend for use in wet, oily or dry areas. Mat Type: Anti-Fatigue Mat Application: Indoor Materials: Rubber.lt;BR/gt;lt;BR/gt;lt;stronggt;RCP2005CHAlt;/stronggt;lt;BR/gt;Crown WSCT35 TCO Safewalk-Light Anti-Fatigue Drainage Mat, 3' x 5'lt;BR/gt;Handy dustpan features a tapered front edge to help simplify sweeping-up. Heavy-duty, moderately flexible plastic provides commercial-grade durability. Lanyard handle-hole allows you to hang and store the pan out of the way. Material(s): Polypropylene; Width: 8 1/4quot;. ~ Includes one dustpan.